The wife of Zimbabwe's 92-year-old President, Robert Mugabe, has said that he is so popular that if he died, he could run as a corpse in next year's election and still win votes. Grace Mugabe, 51, was addressing a rally of the governing Zanu-PF party. Mr Mugabe has governed Zimbabwe since the end of white-minority rule in 1980 following a bitterly fought war. His wife, who has often professed her undying loyalty to her husband, has assumed an increasingly high profile. "One day when God decides that Mugabe dies, we will have his corpse appear as a candidate on the ballot paper," Mrs Mugabe told the rally in Buhera, south-east of the capital Harare. "You will see people voting for Mugabe as a corpse. I am seriously telling you - just to show people how people love their president." President Mugabe has been backed by his party to stand again in next year's election, but recently cut back on his public engagements. Grace Mugabe has warned contemporaries of Mr Mugabe from the guerrilla war era that they are not in a position to replace him because they likewise would be too old. "Anyone who was with Mugabe in 1980 has no right to tell him he is old. If you want Mugabe to go, then you leave together. You also have to leave. Then we take over because we were not there in 1980," she said, gesticulating towards herself. Last September, the president was rumoured to have died after he reportedly cut short his attendance of an AU summit to fly to Dubai for a health check. 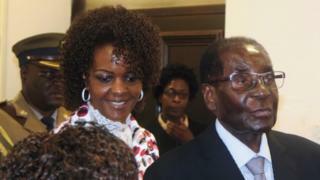 Mr Mugabe later joked about the rumours, saying he indeed died but was only resurrected.